Went to her new home on Sunday 31st July 2016. 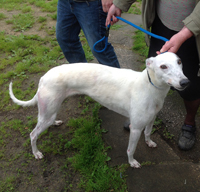 Ice a very pretty white female ex-racing greyhound who was born on the 16th April 2012 and weighs 26k. She is house trained, spayed, inoculated, microchipped and recently had a dental when 8 teeth were removed. Ice is a lovely friendly girl who from what we've seen is okay with other breeds of dogs, walks nicely on the lead and travels well in a car. This afternoon Ice arrived and what a pretty little girl she is - all white with a bridle patch over one eye and patches of brindle on both ears. 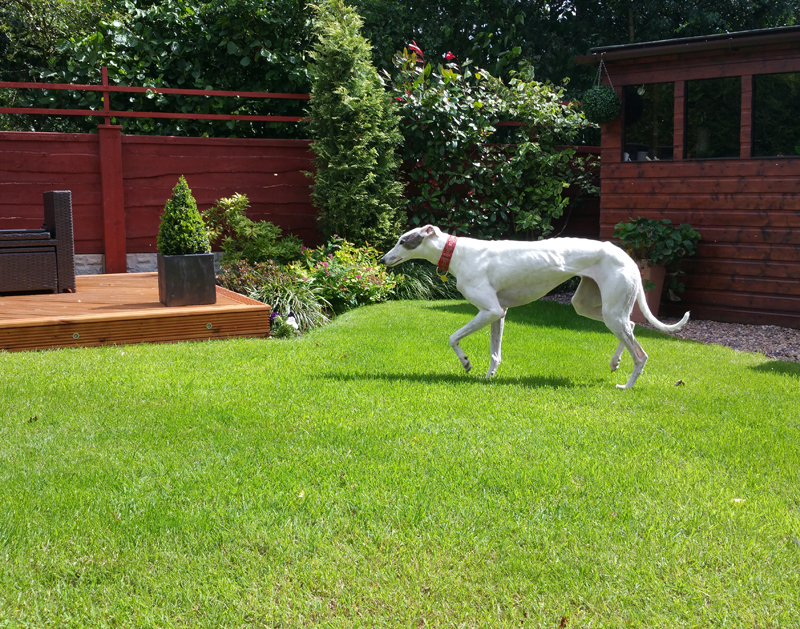 A little anxious to begin with she met all the other greyhounds one at a time until they were all in the garden with her. A few sniffs to say hello and then she settled. Ice slept in the house last night and we never heard a sound from her all night, come breakfast time she was a bit picky with her food, which may be her teeth or different food to what she is used to. This lunch time we called in on a couple with Coral and Ice to meet their Jack Russell with a view to them adopting one of them. 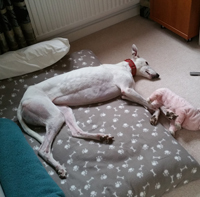 Although a little anxious at her new surroundings she didn't bother with the Jack Russell but the couple chose Coral with her being with us longer and more settled and laid back. 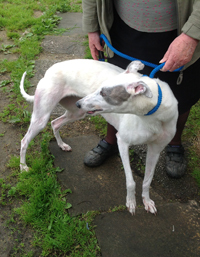 This morning Ice went to the vets for her dental where she had 8 teeth removed including 3 left upper molars. Stuart collected her late afternoon and we settled her in the living room for the evening to sleep things off. Around 9.30pm she started following us around and wouldn't settle, something told me she was hungry so I soaked some of her complete food and put some chopped meat on it, mixed it up, made sure it was tepid, put a Tramodol capsule on top and gave it her. She 'wolfed' it down and was looking for more, but it was enough for the first night after her anaesthetic. After that she settled. This morning Ice looked much better and ate all the soft food we gave her, which had her antibiotic and Metacam on top - she was really hungry! She's on soft ‘body temperature’ food for 3 days then soft food for a further week to allow her stitches to heal, then slowly back to her ordinary food over the next week then she will be fine to eat as normal and be given normal chews and rawhide bones etc. and undergo a teeth cleaning routine. All day she kept coming to us and looking longingly at us – she was saying ‘thank you for getting rid of my pain"! We’ve seen this happen before with Greyhounds who’ve been in great pain through toothache and a dental has removed it. She’s more settled, relaxed and happy now she’s feeling better. She's a lovely dog. 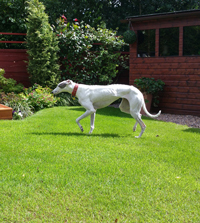 This afternoon Ice, who is now named Winnie went off to her new home where we hope she will have a long and happy life with her new family. 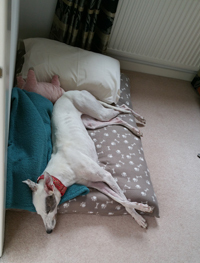 Received some photos today of Winnie settling in her new home. 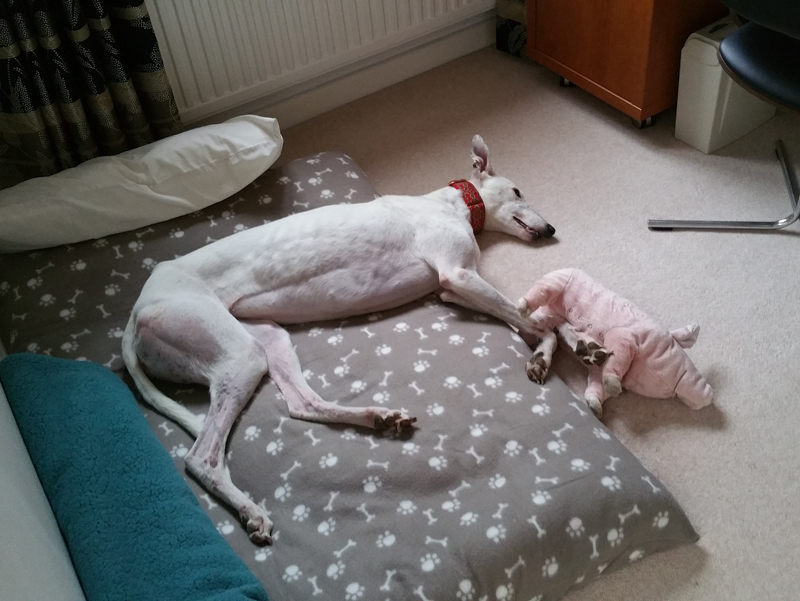 We received an email today from a gentleman who homed Winnie's litter brother. Now called Hamish, his racing name is Go On Star and he's alive and well and living in North London. 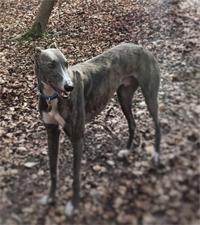 The picture he sent of him is a recent one of him in the Chiltern Hills.